The day is finally here! 2015 Pantone Quilt Challenge: Marsala details! Today Adrianne from On The Windy Side and I are thrilled to announce that we are co-hosting the 2015 Pantone Quilt Challenge: Marsala! We loved running the 2014 Pantone Quilt Challenge last year, and we can’t wait to see what amazing creations you come up with this year. We’ve got some inspiring posts lined up, fabulous guest judges, information on where you can find awesome Marsala fabric to work with, not to mention the incredible prizes up for grabs which have been provided by our wonderful sponsors. This swatch is the official Marsala colour. We know that finding fabrics in this exact colour isn’t easy, so don’t worry, the fabric in your quilt does not have to match Marsala perfectly. Grab our button and spread the word that the 2015 Pantone Quilt Challenge: Marsala is on now! So, straight into the nitty gritty, here are the rules. They are pretty much the same as last year, with a couple of very small tweaks. 1. A link party/gallery will be hosted at Play Crafts and On the Windy Side. Entries will be open from April 17 – April 24 2015. Entries will close at on April 24 at 11pm PST and winners will be announced on April 29 2015. Now, onto the exciting stuff! Our sponsors have been more than generous, which means we have wish-we-could-win prizes on offer. Here are the details, and while you’re there, please check out our lovely sponsors. We thought it would be fun to provide a place for people to share quilts that feature Marsala that don’t comply with the rules for the 2015 Pantone Quilt Challenge: Marsala (for example, because they were not finished in 2015). We will be providing a separate link-up for people to share these quilts. However, they will not be eligible for judging, voting, or to win prizes. We are well and truly aware that people have their doubts about Marsala. Nevertheless, we really encourage you to step outside your comfort zone and try using it in a quilt. You can always just make something small so that it’s not a huge investment of time and fabric – and you know, it’s called a Challenge for a reason! To give you a helping hand on your Marsala journey, here are some posts to get you started: my thoughts on Marsala including a fabric pull, Anne’s thoughts including some suggested palettes and quilt designs, Latifah Saafir’s thoughts and Debbie at A Quilter’s Table’s thoughts. We would love to see your creations while you’re working on them, so be sure to add them to the 2015 Pantone Quilt Challenge: Marsala Flickr Group, or tag them on Instagram using #pantonequilt. You can find all the prints in this special Marsala collection here. Keep an eye out for more suggestions on where to find Marsala fabric – we’ll update you if we find any other bundles. So get your thinking caps on and get to it! I can’t wait to see your entries! I’m a little confused by the entry deadline. Says entries and judging are in April 2015, but earlier it says entries must be completed in 2015, which implies December 2015. Hi there! Thanks for asking about that. We just mean that we don’t want quilts finished last year entered, it needs to be something you’ve finished this year before April. Last year we said quilts had to be started in 2015, but we relaxed it this year to allow things that you might have started that are fitting but aren’t finished yet. I love a good challenge, and I’m not completely repulsed by Marsala, but it certainly isn’t a color I would gravitate towards. This is going to be FUN! Thanks for hosting this. Hahahaha I love your breakdown of Marsala. 🙂 I’m really excited to see what people do with this one! It is definitely one of the harder colors Pantone has thrown at us, and I know people will rise to the challenge! Well I am excited, my fabric arrived this week and I do know what I will create with it this year for this challenge. I am hoping I can even quilt it in time! So this weekend I will finish one quilt and start on finishing another, so by the end of next week I hope I can be putting together this quilt for this challenge, bring on Masala! Fantastic! You’re well on your way with this challenge. 🙂 I’m so excited to see what you make with your fabric. Which fabric did you get if you don’t mind sharing? I know it’s not easy finding fabric the appropriate color! This year more than any before will provide quite the challenge I think. There are just not a lot of fabrics in that color range, and it’s a neutral-ish which makes it tough to feature. But /because/ it’s so challenging, I am really excited to see what people make with it. 😀 I know y’all are gonna knock it outta the park! I’ll try to give it a try (I heard creativity was at its best under pressure). The most difficult in this might be to find any fabric in marsala (that I like). Luckily I managed to find some scraps of unknown solids looking like it (the pleasures of stash archaeology), so I think it will be the Minis category for me. 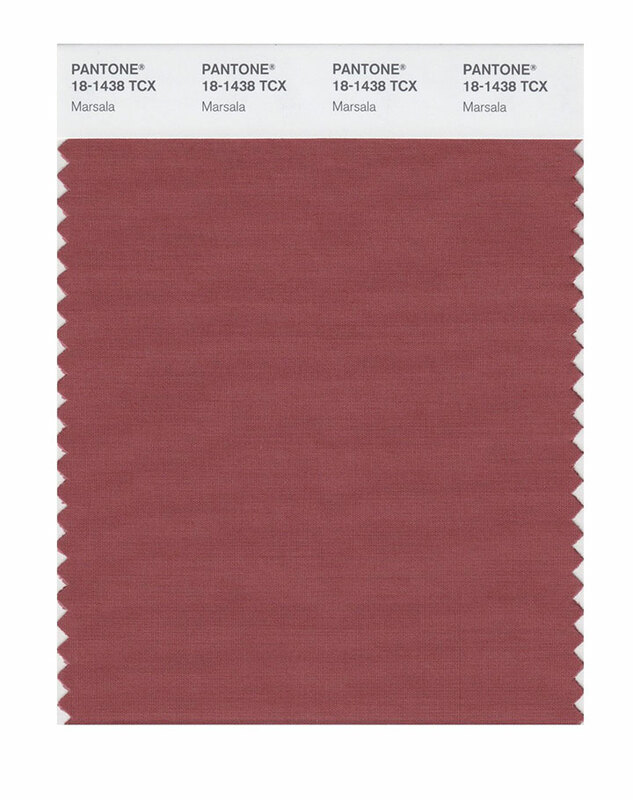 Finding marsala fabrics is really quite tough, which is why we’re being pretty lenient this year on how closely the color matches. Even when you look at the Pantone site, they show designer clothes in everything from brick to wine to crimson, and very little that is truly “Marsala”. So we’re going with that. 🙂 I can’t wait to see what you enter! already working on my projects. it is surprising, or maybe not, how many designers (Kaffe, AMH, Tula, all my favs) use Marsala to make other colors shine, its not a neutral but it almost plays like one. i for one am loving it. I’m running another fabric giveaway, and you are welcome to enter! I hope you’ll enter the challenge! 🙂 Thanks for the info on the giveaway! I just love the color! I saw a tissue box with the color and I saved part of it because I wanted to see what I could find in that color. Well I opened my email from Hawthorne tonight and there it was, Marsala!! I am ordering some fabric tonight. I’m not real good with the linky thing. When the time comes, here is a pretty good tutorial on how to use the linky thing. Hopefully it will make sense of it, I know it can be confusing! I’m liking this color, in all it’s various shades! It’s got me wondering what dyeing fabric in actual Marsala wine would turn out like? Leaving some longer in the solution than others should produce lighter and darker shades. Hmmm, even if I don’t enter this challenge (which I really want to, but baby #9 is due at the end of March, so we’ll see. ), I think I’m going to have to try this and see what comes about. Also baby #9! Congratulations! 😀 How exciting! I find it so interesting how I am influenced by QDAD-ers’ designs. We all have our own styles but we trade ideas, get inspired by others personal challenges or series. I love it! And feel like my designing has improved ten-fold. omg, seems like i just finished my Orchid quilt!!! i like Marsala tho, and i’m sure i have some PILE i could turn into a Marsala challenge! and even if not, i love the challenge and will look forward to all of the cool things people will come up with! My daughter insists that I should enter an apron, but I don’t believe it would fit into any of these categories. Would an apron or any garment be acceptable?